A recent case before the Second Appellate District tasked that court with addressing an unusual case of reimbursement following the post-divorce sale of a couple’s marital home. The appeals court reversed a trial court’s order of reimbursement in favor of the wife because that trial court made several procedural errors, including improperly refusing to consider the husband’s argument that the wife unreasonably delayed in selling the home. The couple in this case was a pair who decided to divorce in 2007 after almost 25 years of marriage. Eight months later, in early 2008, the divorce became final. That order called for the wife to manage the sale of the marital home. The wife was not able to complete a sale of the home until 2013. The sale produced net proceeds of $430,000 for the couple, of which each spouse got $215,000. After the escrow company paid the proceeds, the wife went to court to demand that the husband pay her almost $56,000 in an “equalization payment.” She argued to the court that she had, between 2008 and 2013, spent $111,900 of her separate property on the house and that the husband owed her a sum equaling 50% of that total. The husband argued that he owed the wife nothing. His half of the sums that the wife spent out of her separate property on the house, such as loan payments and property tax payments, should be considered to constitute (or be in lieu of) spousal support, he contended. The trial court generally sided with the wife, declaring the loan payments and the property tax payments to be “omitted community property debts,” for which the husband was 50% responsible. If you are seeking reimbursement for unresolved community property debts you paid, or your ex-spouse is seeking such reimbursement, you need to have skilled and knowledgeable counsel on your side. 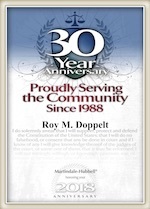 The experienced San Diego family law attorneys at Roy M. Doppelt & Associates have been assisting clients throughout Southern California, including in San Diego, Encinitas, La Jolla, and Chula Vista, for many years, helping clients resolve reimbursement and many other divorce-related cases. For a free consultation, reach out to Doppelt and Forney through our website or call toll-free at (800) ROY IS IT (769-4748).